Known as the “Spirit of Syria”, Qatifaan worked with the Deraa Media Union, a group that documents atrocities surrounding the Southern Syrian city of Deraa. The Syrian Expatriates Organization was deeply saddened to receive news of the death of 14 year old Syrian citizen journalist, Omar Qatifaan. He was shot while documenting events in Deraa, Syria on May 21 2013. Known as the “Spirit of Syria”, Qatifaan worked with the Deraa Media Union, a group that documents atrocities surrounding the Southern Syrian city of Deraa. According to colleagues, he was known as one of the bravest, frequently refusing to abandon filming despite being surrounded by danger. 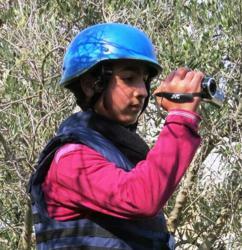 Citizen journalists play an integral role in documenting events in Syria. As free press is not allowed in Syria, citizen journalists have assumed a key role in the collection and dissemination of news.